UPDATED: 16/02/17. Now customizable in-game. Please remove previous versions. 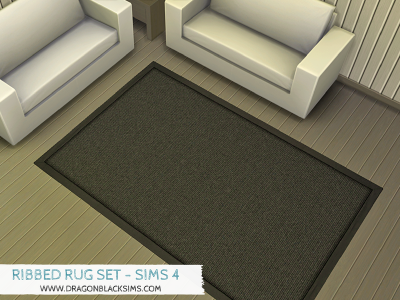 This is the Ribbed Rug Set. The Ribbed Rug has an almost cord-like texture with a smooth fabric border. Comes in 6 color variations. More color /pattern options will be added once I finish my current pending items. Custom swatches have been added so you can easily identify them in-game.